For most Russians Samara means the famous "Zhigulevskoe beer", "Assorti" chocolates from Europe's largest chocolate factory Rossiya or Lada cars from the Volga automobile factory in Togliatti. The Samara Region also brought us the space rockets, which put the moon walker and the world's first astronaut Yuri Gagarin into space, Tu-154 airplanes, TogliattiAzot, the largest fertilizer factory in Europe, and the metallurgical factory Alcoa. How is this major Russian region faring today? In its architecture Samara is a European city: the centre has many new monolithic buildings, new shopping and business centres have sprung up everywhere and we even have a Renaissance Hotel. Samara residents are not like Muscovites: they are less rushed and less business-like. They are workers and they get things done. Samara shouldn't be considered provincial just because it isn't the capital of Russia. We have many higher education institutes that turn out first-class technical specialists and in the humanities too. Samara manufactures everything imaginable from sweets and televisions to cars and spaceships. The local salaries are modest (and have been depressed even further by the crisis), though the prices are the same as in Moscow shops. The minimum wage in Samara in the first quarter of 2009 was set by the authorities at 5,450 rubles, or $160. According to the Regional Statistics Directorate the average salary in Samara is 10,000 rubles, or just over $300 and most of it goes on housing and utilities. I have a friend called Andrei, who is an engineer at the TSSKB-Progress factory, which manufactures space rockets. He lives with his wife Olga, who lost her job last November (she was a manager in a mobile phone shop), and their small son. Andrei gets no relief on housing and utility payments, on which he spends over 30% of his salary of 10,000 rubles. He pays 3,000 rubles (96.46USD) a month for a two-room apartment with hot water and heating and an additional 300 rubles for electricity. Grocery prices in Samara are higher than in neighbouring Saratov or Ulyanovsk. The authorities have announced a moratorium on grocery prices, but it's impossible to keep the prices down. Andrei and his family spend almost his entire salary on housing and groceries. For the remaining $150 they buy cheap clothing and shoes at the market. Andrei talks about politics a great deal, especially after dinner. He doesn't vote, as he believes that the government has already decided everything for him, and that his vote won't change anything. When friends advise him to find a job that pays better, for example working as a tutor or writing papers for students to pass off as their own, Andrei refuses. It matters to him that he should be working in the public sector. His salary is more than modest, but he works in the defence industry, so is not afraid of losing his job. He works no more than two weeks out of four: the rest of the time he is on sick leave, or taking time off in lieu. His record of service is perfect: he has worked in the same place since he graduated 20 years ago. He makes regular payments to the trade union and the pension fund. He is one of thousands of engineers at the factory, so he can "twiddle his thumbs" during working hours with no concerns about efficiency or productivity. He's not used to working for himself. He wouldn't be able to function at all in a private design office, where specialists have to be flexible and competitive as well as having numerous certificates and advanced training courses.. So instead of a highly-paid job in a private firm, he prefers to work at a state enterprise. "The main thing is that my future pension is guaranteed," he says. Life for retired people is even more difficult than it is for Andrei and his family. Often their entire pension is not enough to pay for even the essentials. Many are forced to rent out their flats in order to get enough money to live. In the industrial part of Samara, the multi-storey concrete apartment buildings used to be inhabited exclusively by workers from the large factories. Today many families are forced to send their elderly parents to old people's homes, because they can't afford to support them. The industrial districts, which were until recently the pride of Samara, are now hotbeds of alcoholism and crime. Young people take drugs and steal. The adults have let themselves go, lost their jobs and taken to the bottle, convinced that they will never emerge from poverty. The police report a high level of drunkenness among the unemployed. There have been mass layoffs in the province. The population of Samara is 1,718,800: unemployment currently stands at 156,400, according to figures from the regional Ministry of Labour. In March there were 35,000 people in Samara who had been transferred to part-time work, 107,000 had been asked to take leave and were receiving only part of their wages, and 31,000 people were on unpaid leave. Many of them, like the wife of my engineer friend, have been advised by the employment service to retrain, so as to be able to find a job. A woman, who graduated from a trade school, had to learn to be... a caretaker. But it's not even easy to find this sort of work. The authorities of the Samara Region and governor Vladimir Artyakov, concerned by the growth of alcoholism, have set up a special programme to address this problem. It is poorly implemented, as is the employment scheme for people who have lost their jobs. The authorities say that this is because excessive drinking is a social disease, and the problem can only be solved if people have good jobs and an optimistic outlook. Unemployment benefits in Samara are very low, not enough to support a family. Only basic food produced at dachas and garden - potatoes, cucumbers and tomatoes - prevents people starving during the crisis. Samara is a city of contrasts. 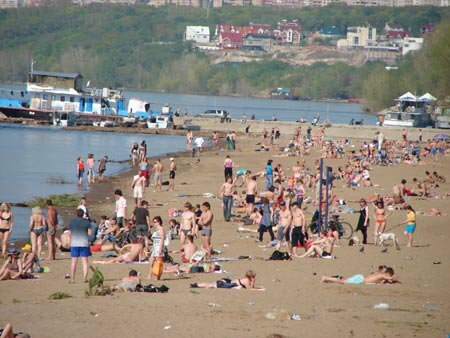 Volga river beaches are always crowded in the summer even in times of crisis. Samara is a city of contrasts. Kirov Square in the centre of industrial Samara is now the main place for protest demonstrations. These are usually organised by the communists. It's hardly credible, but they still enjoy considerable support nearly twenty years after the collapse of USSR. Human rights organisations are poorly developed here and their activists don't have anywhere to meet people and talk to them about their problems. The major local NGO Golos, (Voice) and other similar organisations have been forced out of their Social Centre by the office of the mayor of Samara. In the early 90s human rights groups had been given this building by a former mayor, Oleg Sysuyev. Now the mayor's office has taken them to court to evict them from the Social Centre, claiming that they have no lease for the building. The organisations say they must have a place to work. Alexander Lashmankin, editor of the Samara human rights information agency Svoboda (Freedom), claims that "Samara residents don't need human rights advocates". He believes his own experiences are proof of this. In the spring Lashmankin, as representative of the "Samara Anti-conscription Group", opened a human rights consulting office for army recruits. Just 5 people out of the 5000 recruits due to be called up in the spring came for consultations. "Young people prefer to get out of serving in the army by giving bribes. There are very few people who wish to defend their right to be exempted from army service in court"- says Lashmankin. People have no faith that a court can help them to defend them if their rights have been infringed. The president of the Samara Legal Centre, lawyer Nikolai Gavrilov, has been involved in the project "Stop corruption!" for seven years. Legal consultations teaching people how to fight corruption among officials are free, but Gavrilov says that people today are not very different from the characters in XIX century satirical novels by Mikhail Saltykov-Shchedrin, who have no faith in the law. "There are anti-corruption laws, but they are not enforced, because people are scared of complaining about officials who take bribes. They won't give evidence against officials or the police. People don't believe that an official can be fired for taking a bribe. So they bribe the traffic police and buy MOT certificates, even for new cars that are in perfect working order. Unfortunately you can't pass the MOT any other way. But if you hand over enough money, even rusty cars that don't meet the Euro-2 standards will pass the inspection. People are used to bribing officials, which is exactly what the officials want," says Gavrilov. "People in Samara are more concerned about how to pay the rent and buy food than they are about human rights," says the coordinator of the Samara human rights association Golos, Lyudmila Kuzmina, who has an equally pessimistic view. She says that there were many violations during the elections for the chief executives of the local authorities in the Samara Region, but they went unnoticed. "Despite the international financial crisis, people are happy with the way things are. It's a modern ‘stagnation'". Kuzmina believes this explains people's behaviour at election time, when they automatically vote for the ruling United Russia party. "They've turned into zombies. Any activity is suppressed." Kuzmina and her friends attempted to organize a March of the Dissenters last year. The authorities responded immediately by sending the police unit dealing with pirated computer programmes into the Golos office. Computers were confiscated for examination, though no prohibited or unlicensed programmes were found. With no computers the organisation was paralysed. Human rights advocates and independent journalists are constantly summoned to the Department dealing with problems of extremism for instructive talks. "Maxim Kalach, a journalist at the Samara office of Kommersant, refused to go to one of these talks voluntarily, but he was taken there by force," says Kuzmina. 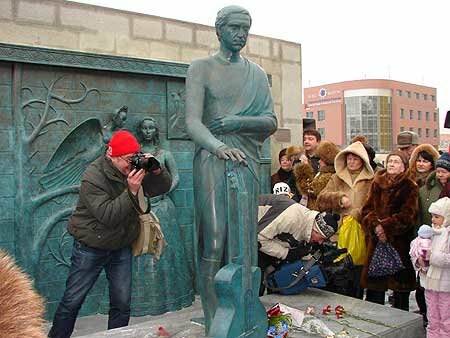 The famous Russian sculptor Mikhail Shemiakin designed Samara's monument to the legendary poet and artist Vladimir Vysotsky. Opposing the authorities is not important for people in Samara. What they want is an understanding that the authorities are genuinely concerned with improving the living standards of ordinary people. This was shown in March when Prime Minister Vladimir Putin visited Togliatti. The Volga Automobile Factory (VAZ) is the most important in the Samara region. Even though much could be said about the poor quality of its products, the consequences for the region if it were to declare bankruptcy would be dramatic. VAZ is the largest contributor to the regional budget, so Putin's visit and his promise to restructure the factory's debt of 44 billion rubles was a very important event for the region. I was there when Putin came to VAZ. On the way to Togliatti I was thinking about the January demonstrations in support of the Russian motor industry. I should say immediately that spontaneous, unsanctioned actions of this kind don't happen here. People may not like a lot of what's going on, but there's no question of taking to the street without permission. However, the leadership realises that even a small demonstration of popular anger can affect decisions made in Moscow, so people were offered 100g of vodka to take part in the January demonstrations. VAZ had enormous debts and even the workers understood the implications. Many people were quite open about their fear of losing their job and their wages. How would they be able to feed their families? What they expected from Putin was that he would grant the factory a loan and they weren't disappointed. Their Prime Minister didn't let them down. There will be money, people said to each other. The main threat had been lifted and for the time being life could go on as before. An event which changed people's attitude to the authorities for the better was the appointment of a new governor of the Samara Region. Two years ago President Putin accepted the resignation of Konstantin Titov, who had been governor for 16 years and was one of the best-known regional leaders. For many people in Samara Titov was not just the governor, but the local Tsar. Everyone here knew that he had surrounded himself with a circle of cronies. Among the people who influenced the political preferences of governor Titov was his son Alexei (the chairman of the board of directors of Solidarnost bank) and his sister-in-law Elena Shasharina (the regional Minister for Social Development). People were angered and frustrated by the excessive bureaucracy of Titov's administration. He had entered politics as a liberal in August 1991 with the blessing of the first Russian president, Boris Yeltsin, but over the years Konstantin Titov had become a cunning political intriguer, changing his membership from one political party to another. When the former VAZ president Vladimir Artyakov was appointed governor in August 2007, the region saw real improvements in industry and the economy. Artyakov is believed to have the rank of general and is a man of the Kremlin and the Russian defence industry. He implements federal policies confidently and rigorously. But even the best governor would have been unable to insulate the region from the consequences of the worldwide crisis. Oil prices crashed on the global market and the crisis arrived in Samara with no hope of avoiding its brutal consequences. Faced with the new hardships and difficulties, Russians reacted in ways they have developed over decades, if not centuries. The whole region was engulfed in social apathy: life and its patterns have remained practically unchanged here since Soviet times. People in Samara and Togliatti are fed up with protest demonstrations, with demanding that the authorities pay the wage arrears, and with ever increasing prices. One of my friends, Valery Vladimirovich, works as a watchman. He describes the present times as «Putin stagnation» and says that life in the regions is very different from life in Moscow. Samara residents have retained their Soviet habits. They want the state to provide them with a job and housing, a stable wage and no problems with louts in the streets. Valery Vladimirovich maintains that people are totally indifferent to political parties, be it United Russia or the communists in power and whether the prime minister is a former KGB officer or a Nobel prize winner. People want stability, but where will they get that from these days? 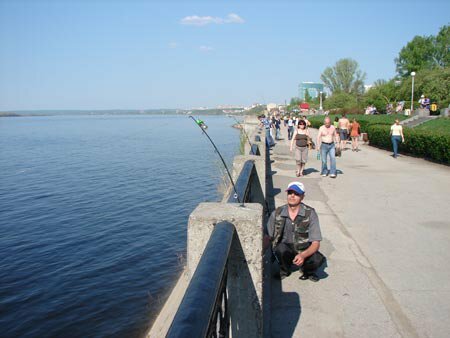 In Samara too there is always the hope of catching a big fish.. The Samara Region is the fifth largest region of the Volga area, with a territory of 53,600 km², which comprises 0.31% of the territory of Russia. The Region is 335 km long from north to south, and 315 km from west to east. It borders the regions of Saratov, Ulyanovsk and Orenburg and the Republic of Tatarstan. It also has a short border with Kazakhstan. The population of the Samara Region is 3,170,000 as of 1 May 2008, the second largest in the Volga area and the 12th in Russia. By population density (59.7 people per km²) it is the 10th region in Russia (not counting Moscow and St. Petersburg), and its level of urbanisation (percentage of urban population - 80.3%) puts it in 11th place (without taking into account autonomous districts). The region's largest city is Samara with a population of over 1 million.